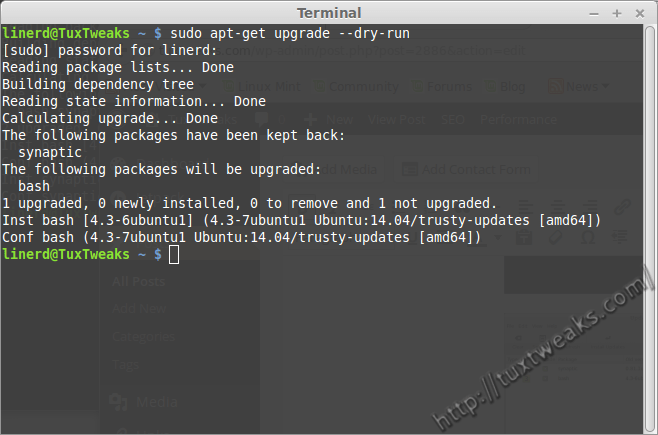 I've written before how to restore the Mark All Upgrades button to Synaptic in Linux Mint. Things have changed in the latest version: Linux Mint 17 Qiana. The previous technique no longer works because the Mint team is providing their own version of Synaptic rather than using the package from the Ubuntu repositories. 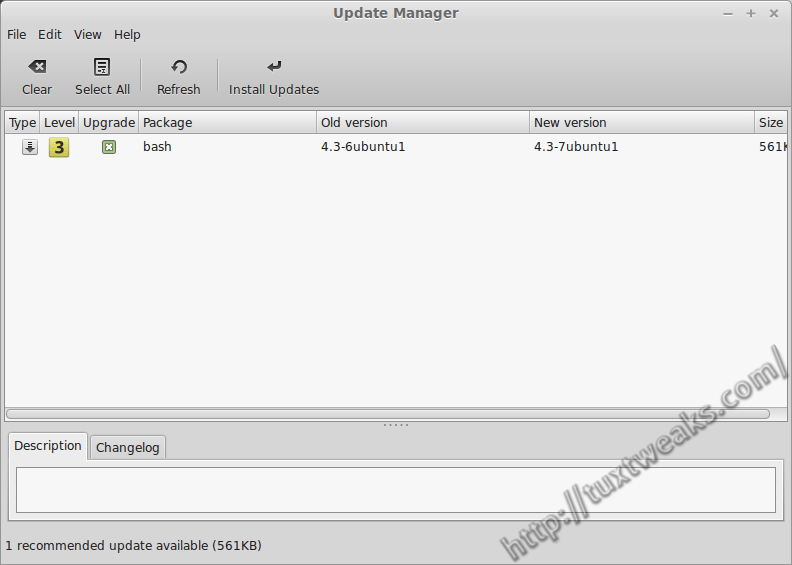 The following will show how to restore the Mark All Upgrades button to Synaptic in Linux Mint 17. It turns out that the Mark All Upgrades button was disappearing from the toolbar after a reboot, even though it remained on the Edit menu. We'll have to use a portion of the old tutorial to prevent that. This will create a file that prevents Linux Mint from over-writing the Synaptic menu. 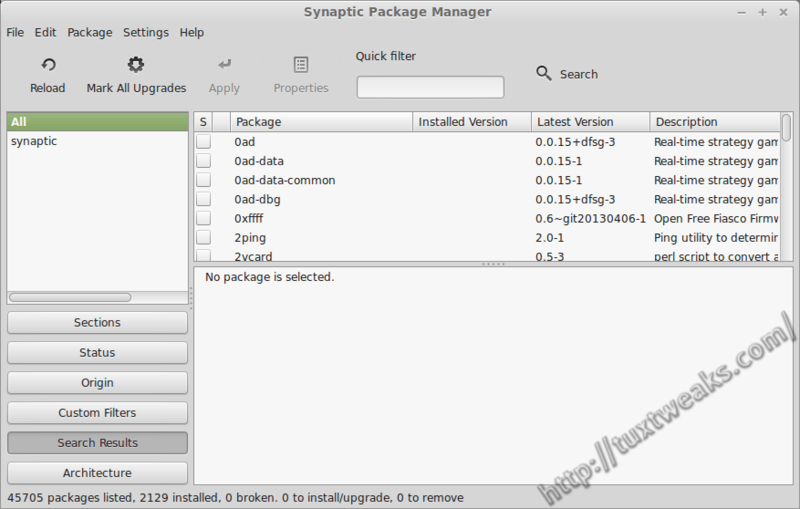 Open the Synaptic Package Manager and search by name to find the synaptic package. At the time of this writing, it's currently at version 0.81.2-4. Highlight synaptic and go to the menu to select Package -> Force Version... In the dialog pop-up, select the version from trusty-updates and then click Force Version. This will tell Synaptic to downgrade the package. Click the Apply button to downgrade Synaptic. Immediately after applying the downgrade you may notice that the synaptic package is showing that there is an available upgrade. You don't want this upgrade to happen, so make sure the synaptic package is highlighted, then go to the menu and click Package -> Lock Version. Close the Synaptic Package Manager now and reopen it. You should now see that the Mark All Upgrades button has been restored. If you only update your system using Synaptic, the instructions above will have you covered. But if you happen to use apt-get, then it will override the settings in Synaptic and update the synaptic package to the one from the Mint repository as you can see in the following screen shots. mintUpdate will also show the package, but it won't actually upgrade it. It will be annoying though because the update indicator in the system tray will always show updates available. You can use any of the following 3 commands to verify the hold status. 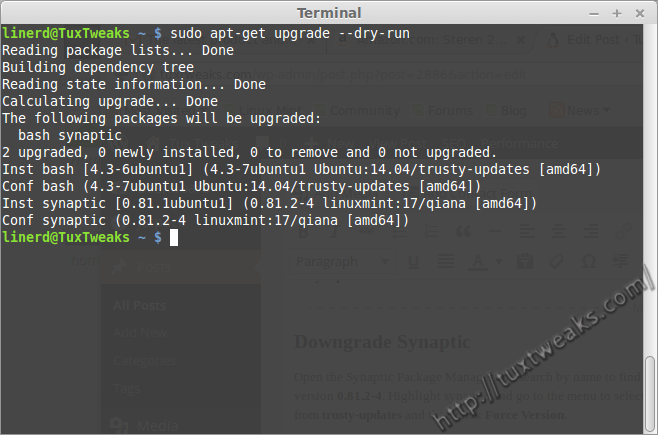 Now you can upgrade with apt-get or mintUpdate without upgrading Synaptic. So there you have it. 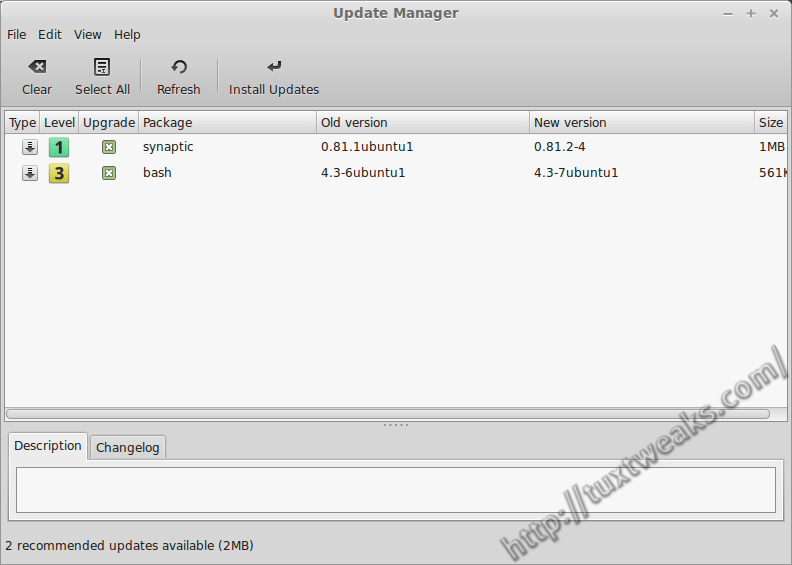 You now have Mark All Upgrades in Synaptic and can now do full system updates of Linux Mint 17 Qiana using the Synaptic Package Manager. Nice and solid tut, thanks for it. Works greatly on Mint 17.1 Rebecca. I suspect only (was too lazy to try this out) that latest version 0.81.2-4 is also good to go with this trick. I've compared the source packages (especially the gtk, and debian folders) from mint, ubuntu and debian-sid and found out that they leaved the gtk/gtkbuilder/window_main.ui file untouched (it has the Mark All Upgrades... button). So I don't know really what they've done to remove it and its functionality, since I couldn't found anything in the patches, nor in the rules buildscript, showing that they played dirty somehow with the compiling process. So, I'm curious about how they managed to do that trick...? Has anyone a clue about this? I've been assuming they do something at compile time to remove the button, but I haven't dug into the source to really see. (Honestly, not sure I would understand the source enough to tell anyway.) I'm just glad I was able to restore the button to Synaptic, as this is really the only complaint I have about a fresh Linux Mint installation. Thanks for the tut, shame that Mint doesn't just use the normal version of Synaptic as I find the Mint updater annoying and use either the terminal or Synaptic to install my software!. I downloaded a .deb package from http://pkgs.org/ but when I tried to remove Synaptic via the terminal, I was told that it was going to remove most of Mint OS with it!. This is a first try for me with Linux Mint 17 and apart from the episode with Synaptic, I must say that it is a nice looking OS. Clear and concise. Worked as a charm. I'm a little late to the game here, but why isn't anyone talking about why this problem exists in the first place? Seems to me that "freedom" is being taken off the table. Maybe the Mint team was tired of helping people fix broken packages. Maybe cows will fly some day...regardless of the reason, it looks like those of us who prefer to work our updates via synaptic are being shown the door. We'll probably be taking our hat off the hook and accept that offer. This smacks of some of the elitist mentality Gnome took toward their users. We know what's best for you. This was a bad idea. I have a number of addition PPAs for packages beyond the software repository that now will not update / upgrade. Please provide instructions to reverse this process. Attempting to do so through Synaptic has failed. 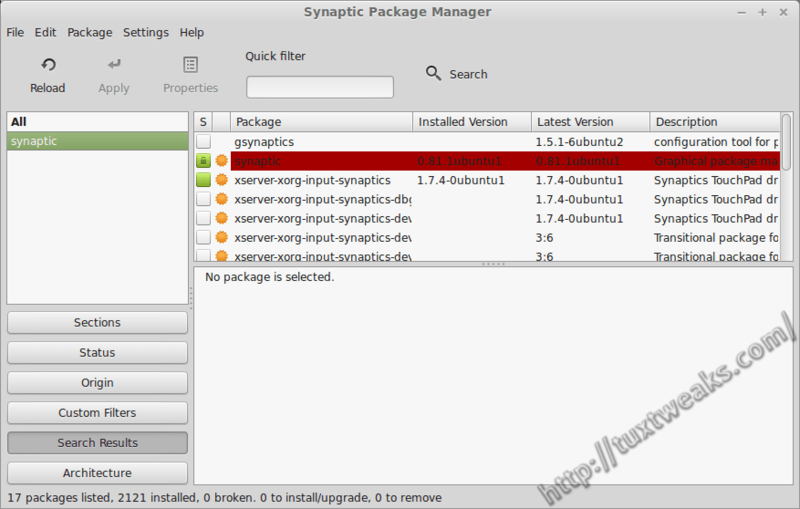 Go into Synaptic, search for the synaptic package, highlight it and go to the menu and select Package -> Unlock Version. Then make sure synaptic is marked for upgrade and apply. You will need to close Synaptic and restart it after that to see the changes. At this point, everything should be back to the way it was. Is there something I have overlooked or messed up that needs additional correction? If you get prompted about changing a configuration file, choose to install the package maintainer's version. A change in your lsb-release file may have happened during the Synaptic downgrade and that may be what has broken your PPA's. The other option may be to stay with the downgraded Synaptic and just manually correct your lsb-release entries so that the PPA's will work for you again. May need to unhold the package with apt before the upgrade. I'll check back later and see what you think. I have only been on Linux full time for about 6 months; I'm learning but not up to snuff yet. I see I have some more updates available on my system, one of them being apt. I wonder if one of the other updates is breaking this for you. I see a message in your listing about generating a boot image. It looks like you are getting a kernel update, which will happen with this method. The Mint team tends to hold back kernel updates for fear that they will break something, (priority 4 & 5 in the update manager. Try upgrading just the synaptic package. If you get the question about lsb-release, hit Y to accept the package maintainer's version. If that all goes through OK, try opening the update manager, refresh packages and see what comes up. Oh yes! Those last instructions appear to have worked... I think. Linerd, thanks so much for taking so much time to help rescue a relative newbie. It is greatly appreciated. Thanks. Beyond the button, the Mint 17 version of Synaptic has crippled the ability to update Firefox (to version 32) and probably other software. After doing this forced downgrade I can get FF32. Thanks for you comment. I didn't know about the Firefox issue. I'm glad to know it helped you out with that as well.